​​LOUISVILLE, Kentucky - Half of the Sweet Sixteen is now complete. We've seen an amazing NCAA Tournament so far, and tonight's action was no exception. I have a funny feeling, though, that the best is yet to come. With both the South and West Regions holding serve, the Elite Eight games for those two regions - with a coveted trip to the Final Four on the line - will both feature the #1 vs #2 seeds when Villanova faces Kansas and Oklahoma squares up against Oregon on Saturday night. Now, like most people, I love a good Cinderella story. But you know what I love more? Top quality match ups between the best teams in the country, and that is exactly what we are set to see. 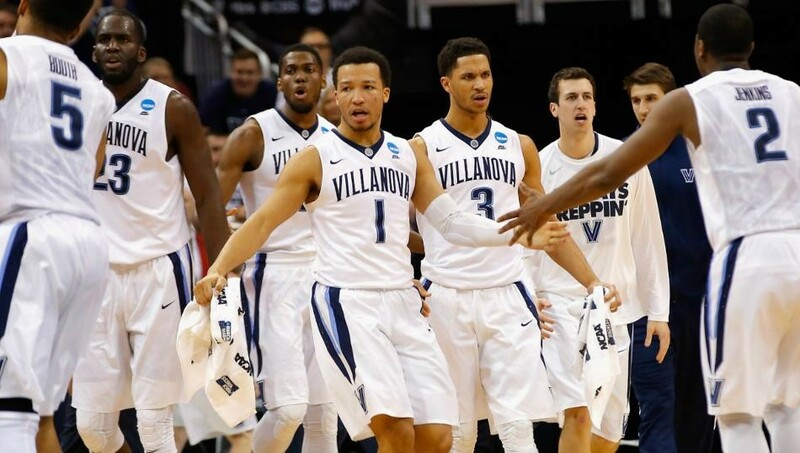 We take now to look in depth at Saturday night's Elite Eight matchups, starting with the South Region where the overall top seed Kansas Jayhawks (33-4) will take on the Big East regular season champions, Villanova Wildcats (32-5). Now Kansas has been the best team in the country for quite a while now, winning both the regular season and Big 12 Conference Tournament titles, and is quite possibly still playing its best basketball right now. Led by a balanced veteran attack, the Jayhawks present a fierce match up at all positions. 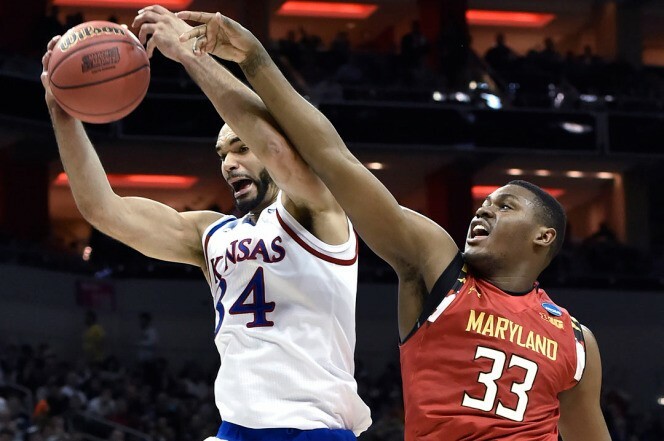 Kansas is currently riding a 17-game winning streak which has included victories over Kentucky, Oklahoma, West Virginia, Baylor, Iowa State, Texas, UConn and, now, a mighty 79-63 thrashing of Maryland from last night. With senior PF Perry Ellis (17.2 ppg, 5.9 rpg), junior SG Wayne Selden (13.7 ppg), and junior PG Frank Mason III (12.8 ppg, 4.6 apg, 4.3 rpg) leading the way, the Jayhawks combine experience, athleticism, and a disciplined offensive and defensive scheme that will attempt to stifle Coach Jay Wright's Wildcats. And do not forget about the outside shooting capabilities. Currently, five Jayhawks in the rotation shoot the three at better than a 40% clip (although junior SF Brannen Green [49.2%] is currently sidelined with an injury). All of those factors should give the Villanova Wildcats night terrors. Now, the knock on Villanova over the last few years has been that they present a predictable brand of basketball centered around four guards and a mediocre man in the middle. Such a style has hampered their ability to win games when they don't necessarily shoot the ball well, which has culminated in early round losses in the NCAA Tournament the last few years. This season, there is not much that has changed, except that currently, the Wildcats are torching the nets from the outside, they are defending with a fierce passion and desire, and C Daniel Ochefu (10.1 ppg, 7.6 rpg) has been anything but mediocre, often stepping up and carrying the Cats during poor shooting performances. Luckily for Nova Nation, that has not yet been necessary to date in the Big Dance because, like I said, the Cats are stroking it (33-62 3FG / 53.2%). That explains why Nova's current margin of victory heading into the Elite Eight is an astounding 24.0 ppg. But, despite the knock on Villanova's "guard-laden" lineup, they actually match up quite well against the Jayhawks, who only start two players over 6'5" themselves - Ellis and 6'10" Landen Lucas (5.7 ppg, 6.6 rpg). Additionally, both teams feature veteran players, with Villanova's PG Jalen Brunson (9.8 ppg, 2.6 apg) the only frosh starter. Tomorrow night I expect to see a fast pace, up and down game with plenty of perimeter action. The keys to the game for Villanova will obviously be whether they can continue to drill it from the outside at such a high percentage. Kansas can defend and they have both the length and athleticism to close out on the wings and contain dribble drives. So whomever wins that match up right there could be a difference maker. Another big key will be whether or not Daniel Ochefu is a factor. He has to rebound and defend like his life depended upon it and can't just be a statue in the middle. He will most likely be matched up with Landen Lucas, but will be looked upon to help Kris Jenkins on Perry Ellis inside. Defensively, Nova has to contain Ellis, not let Wayne Selden or Devonte' Graham getting going from the outside, and take away deep dribble penetration. They also have to limit offensive rebounding, therein holding KU to one opportunity per trip down the floor. Kansas is currently averaging 10.7 offensive rebounds a game. Kansas is a good enough team. Permitting them to get second and third looks at the basket will spell doom for the Wildcats, especially with their lack of depth and size in the interior. For Kansas, Coach Bill Self's group needs to defend the perimeter, meaning no wide open looks for Ryan Archidiacono, Josh Hart, Jenkins or Brunson. Now that is definitely easier said then done with the way the Cats have been moving the ball, but like I said above, Kansas can defend - know that. On the other end, the Jayhawks have to get easy looks inside early for Ellis, which will open up driving lanes for Mason, Selden and Graham, as well as setting up three point looks for each, along with Brannen Greene, should he be healthy enough to play. Now that is also easier said then done, since Villanova has been defending with a reckless abandon, almost like they are still playing with a chip on their shoulder from losing out on a #1 seed after falling to Seton Hall in the Big East Conference Tournament finals. I've been down on Villanova all season, most likely because they've fooled me too many times over the years, including last season when I went on the record declaring them the real deal. Only to then watch them fall to an inferior NC State team in the Round of 32 as a #1 seed. With that being said, however, I would not be surprised in the least if the Wildcats came out playing like they have been, and knocked off the mighty Jayhawks. Prediction: This game will go back and forth for all 40 minutes with the lead never being greater than 7 for either team. If Villanova comes out firing, look for them to grab an early small lead, and may even carry that into the half. The Jayhawks will be resilient, take the Cats' best shot, and rise to the occasion in the 2nd half. Look for big game from the senior leader, Perry Ellis, as well some big buckets from D'Vonte Graham, who Nova may overlook in seeking to stop Ellis and Selden. Down the stretch, elbows and wrists may become a little tight and jumpers may not fall as smoothly as they had earlier in the game. That will certainly benefit Kansas, who can score in a plethora of ways. I like Kansas in a 3-4 point game to advance to the Final Four.